Although I have found no evidence that she ever visited Pembrokeshire it is a fact that Anne Boleyn (c1501 – 1536 ) was granted the Marquessate of Pembroke in 1532 by King Henry VIII, whose second wife she would later become. The Pope never did grant Henry the divorce he wanted and this led to the eventual breaking of the power of the Catholic Church in England and Henry’s assumption of control of the Church of England. Henry and Anne were married in January 1533, although Henry’s marriage to Catherine wasn’t formally anulled (by English church officials) until May of that year. Henry’s marriage to Anne was made valid in May 1533. In June 1533 Anne was crowned Queen of England, and in September of the same year she gave birth to Henry’s daughter, Elizabeth. 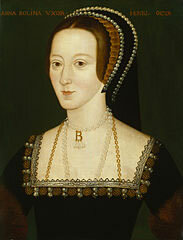 Just three years later, in 1536, Henry was courting Jane Seymour and Anne was being tried on charges of treason. She was found guilty and beheaded in May 1536.